Zhu, Shukl, and Paul, Orthogonal Functions for Systems Identification and Control. Wang, Multilayer Recurrent Neural Networks for Synthesizing and Tuning Linear Control Systems via Pole Assignment. Rovithakis andChristodoulou, Direct and Indirect Techniques to Control Unknown Nonlinear Dynamical Systems Using Dynamical Neural Networks. Park, Choi, and Lee, A Receding Horizon Optimal Tracking Neuro-Controller for Nonlinear Dynamic Systems. Polycarpou, On-Line Approximators for Nonlinear System Identification: A Unified Approach. Billings and Chen, The Determination of Multivariable Nonlinear Models for Dynamic Systems. Kosmatopoulos and Christodoulou, High-Order Neural Network Systems in the Identification of Dynamical Systems. Porter, Liu, and Trevino, Neurocontrols for Systems with Unknown Dynamics. Napolitano and Kincheloe, On-Line Learning Neural Networks for Aircraft Autopilot and Command Augmentation Systems. Tan, Suykens, Yu, and Vandewalle, Nonlinear System Modeling. The book emphasizes neural network structures for achieving practical and effective systems, and provides many examples. Practitioners, researchers, and students in industrial, manufacturing, electrical, mechanical,and production engineering will find this volume a unique and comprehensive reference source for diverse application methodologies. 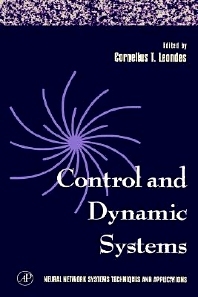 Control and Dynamic Systems covers the important topics of highly effective Orthogonal Activation Function Based Neural Network System Architecture, multi-layer recurrent neural networks for synthesizing and implementing real-time linear control,adaptive control of unknown nonlinear dynamical systems, Optimal Tracking Neural Controller techniques, a consideration of unified approximation theory and applications, techniques for the determination of multi-variable nonlinear model structures for dynamic systems with a detailed treatment of relevant system model input determination, High Order Neural Networks and Recurrent High Order Neural Networks, High Order Moment Neural Array Systems, Online Learning Neural Network controllers, and Radial Bias Function techniques.